Great Central Railway01509 632323work Steam RailwayThe Great Central Railway is Britain's only double track main line steam railway. Train rides are available every weekend and Bank Holiday throughout the year and daily in May through to September. Loughborough is a great station to visit because of its rich history. It has appeared in several films and Sir Anthony Hopkins and Nicole Kidman are two actors who have visited. As the operational headquarters of today’s GCR, you'll often see trains waiting there next turn of duty. During a gala the action is non-stop with trains arriving and departing all the time. 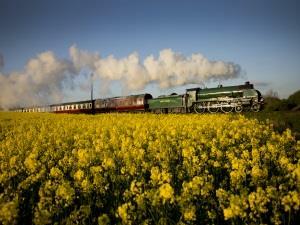 The Great Central Railway is Britain's only double track main line steam railway. Train rides are available every weekend and Bank Holiday throughout the year and daily in May through to September. Disabled visitors, school parties and groups are welcome - please ring in advance. Coach parties by prior arrangement only. Open every weekend throughout the year. Phone for details of steam days and special events. Passenger trains also on selected weekdays, June to October. Located off the A6 near Loughborough. Signposted on all major routes into Loughbrough. Parking on street is available at Loughborough, there is a car park at the stations of Quorn and Rothley.